I think it was the 6th of May this year when R, his sister, his brother in law and myself strolled along Las Ramblas in Barcelona. I may have remarked in my subsequent holiday posts that it seemed a street where people stroll and look at people strolling. Nothing wrong with that really. We have such streets here. I loved Barcelona. It is a wonderful city. We are all old and no great loss, well an advantage to some, if we had been mown down by a terrorist in a van and killed. But what if we just were terribly injured. My current back issues might pale into insignificance. Never mind that young kiddies have been killed in the attack, kids who had their lives before them, full of mystery and hope and uncertainty. What sort of human animal would set out to kill and maim such people? Barcelona has become so popular with tourists that the locals have issues with the sheer numbers of tourists. I get that, and tourism needs to be controlled. The person who scribed on a Barcelona wall with spray can paint, saying, 'If it is tourist season in Barcelona, does that mean it is open season and we can shoot them? ', kind of had his or her wish come true. Sorry darls, I am not allowing you to comment. Not everyone enjoyed the clip of Tracy Ullman playing German Chancellor Merkel. No matter, I think this one, while quite long, and I haven't watched it to the end, but I may do so by the time this is published, is pretty good (note to self, nasty sentence construction, correct later) . I read in an electric newspaper that Chancellor Merkel has come up from behind and it now looks like she will be Chancellor for another term in government. For a young teenage German, she is the only Chancellor they have ever known. Mind boggling. The story was accompanied by a photo, and Mein Gott, how good is Tracey Ullman's made up impersonation. Oh, the irony. 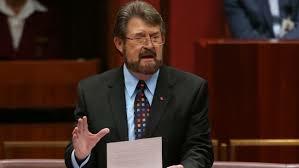 Senator Hinch was once known as the Human Headline, a person who sought out and received media publicity throughout his very public life, yet he is so critical of Senator Hanson who appeared in parliament wearing full female Muslim attire as a publicity stunt. Sorry, I am unable to confirm this is Senator Hanson but that does look like our parliament by the dude wearing a purple shirt with a white tie in the background. 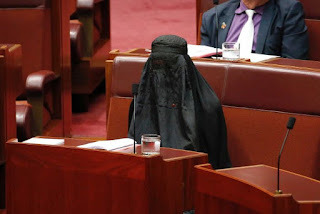 It may well be Hanson...but could actually be anybody, really. Research tells me the clerk or someone checked before she entered. I saw a tall really skinny Asian born guy today. He was wearing jeans ripped at the knees, and his knees were knobbly and unattractive. People do make odd fashion choices at times. Nothing written for today, so here I go clearing the decks again of unfinished posts that go nowhere and don't reach a conclusion. I was going to write a whinging email about the amount of music played on local ABC radio stations. Hello? I listen to a talk station for talk? You may have noticed I like to whinge. It is my English genes. 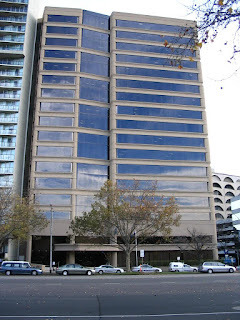 Instead I will write more locally, about my ABC, that is ABC Radio Melbourne. The programme grid begins for me often hearing a little of overnight national radio before 5:30. I expect the broadcaster is not at his or her peak at the point and it is pretty boring. Then on comes Red Symons, a brilliant broadcaster who makes the trivial so interesting. The news and AM are compulsory when I am home to listen to them. AM is followed by the leading Australian morning presenter, Jon Faine. Now, his programme runs from 8:30 until noon. Three and half hours daily is a long time on air. The final hour is called the Conversation Hour. As far as I know, he is only broadcast in Victoria, and his counterpart in Sydney, Richard Fidler, is broadcast all over Australia except for Victoria. To ease Faine's workload, knocking off the last hour and keeping him on air for many more years, I would be ok with Feidler being broadcast to Victoria, as long as the programme is truly national and not Sydney focused. I have heard Fidler on air but I've not listened enough to the content of his hour to know how national his programme is. Then after The World Today comes Clare Bowditch. She is an adequate broadcaster and no doubt a perfectly nice person but frankly I find her a bit boring, and she is so focused on music and musicians to the point I just switch the radio off at 1pm. Rubbish music that will never stand the test of time. Former broadcaster in the same time slot, Richard Stubbs, was quite good, but even he played too much music. Now here is serious suggestion to ABC Melbourne management. Extend the 1pm presenter on air time to 4pm from 3pm, and make Drive presenter Raphael Epstein's reduced 4pm to 6pm programme tightly focused on the happenings of the day and more political. Cut out the frippery and the music and the vomit making Tracks of Your Life. Bah humbug to political correctness. That's what I say (and so does former PM Tony Abbott, oddly linking it to gay marriage plebiscite). Bring back the good old days, when you could call people Wogs, Poofs, Yids and Slant Eyes. Bring back the good old days, when women sought illegal abortions and died or were rendered unable to bear children in the future. Bring back the good old days, when workers were frequently injured or killed at work and nothing was ever done to improve workplace safety. Bring back the good old days, when people could drive cars when they were drunk or drugged and kill people. Surely the world has gone mad with political correctness. We need to turn the clocks back to when we could say nasty things about people, behave very badly and put lives at risks with stupid laws or a lack of laws. (I did look at a few clips from Love Thy Neighbour, but they really do go too far). Time does fly past. It must be a couple of years since the various police branches moved out of the St Kilda Road Police Station to Police Headquarters. It housed the drug squad, the homicide squad, anti corruption squad, and a room containing a lot of telephone books to minimise bruising when the police used 'alternative means' to extract confessions. The building was going to be turned into apartments. The developer wanted a car parking exemption, as there is an insufficient number of car spaces under the building. The developer wanted retail on the ground floor but no loading bay for stock delivery or rubbish removal. The developer wanted extend the first floor right out over the footpath. I assume our local council denied the development and I don't think it went to the Victorian Civil Administration Tribunal for judgement. Photo from 2005. Tradespeople have working inside the building for some time and it seems it will remain as offices. Quite a while ago, workers began putting framework up for what I assume will be cladding, to give the building a more modern appearance. All work stopped immediately after the Grenfell Tower fire in London. I think I can safely assume that the fire rating of the chosen cladding was checked and found to be insufficient, shall we say. Work restarted last week and I think some of the already placed framing has been removed. Old unposted post, but it is not so bad. I am determined to reduce my number of draft posts. Well, I did inhale, of what my father used to call Mary Jane, a pseudonym for marijuana. We even grew some in the very middle class area of Glen Iris. We produced a good crop, very good heads and it was far more than we needed for personal use so we sold it to a friend. That makes me a dealer! I quickly fell foul of Mary Jane. Do you know how long it seemed to take to mow the lawns under the influence of Mary Jane. It felt like hours. I was not liking Mary Jane. Nevertheless, we had some good times with Mary Jane. I may have popped a pill or two in my youth, at warehouse parties. The drug of choice then was ecstasy, the love drug, and you did really feel love for people. The thing about drugs is that they give you very good feelings. That is why people take them. Politicians and everybody needs to understand that drugs can make you feel good and keep that in mind when legislating. They won't stop it. As a callow youth (almost) I just trusted friends that what they gave to me would not kill me. Quite an enormous trust really. GBH (horse tranquiliser?) was around then, but I did not indulge. I have a vague recollection that speed was very helpful for house cleaning the next morning, manic house cleaning. At a dance party in Melbourne a day or so ago, many ended up needing medical care after some bad drugs were sold. Perhaps the drug was too strong, who knows? Some dance parties somewhere in the world set up drug stations where the drugs you are about to take can be tested. Isn't that a good idea? The Victorian government says no. It would rather see dance party kiddies hospitalised because of bad drugs or overdosing. I am now a increasingly conservative grumpy old man, but I have my memories. I trusted friends that I would not get bad drugs. Clearly some people did too at the recent dance party, to their disadvantage. Let them test their drugs before they take them. Of course you could do as the late First Lady of the US Nancy Reagan proclaimed, just say no. That has worked really well, hey. I have posted photos of Melbourne's Federation Square before and you can see them back here. A couple of months ago R and myself took a free tour of Federation Square. Our guide was a volunteer from the Melbourne Visitor Centre and she was terrific. I thought I knew quite a bit about Fed Square, but there was a whole lot I did not know. She took us to a viewpoint. On the right of the photo is the eastern shard. Dominating the photo is St Pauls Cathedral. The squat building is the western shard and to the distress of the architects, it was much cut down to size when it was realised that it would block the view of St Pauls from nearby Princes Bridge and from other angles. Our guide asked our opinion as to whether it should have been built as planned. No one thought it should be any larger that it is and I gave my opinion that Fed Square would be better without it altogether. It does house the Melbourne Visitor Centre, but that is below ground level. It is just an open space at ground level, that is a large entrance to go downstairs. Very difficult to take a photo facing into the low winter sun. Contrary to my belief, these are not sticks to pull and make a rattling noise, well they are, but the noise is the sound of a fire rushing through the dry bushland. They do sound like that when you pull and release them and they clatter together. The beautiful Kimberly sandstone was formed when the area was underwater eons ago. Unlike the sandstone used in Sydney, its parliament house will dissolve one day, this is hard. It has been used extensively at Federation Square. This wall is nearly art work in itself. You'll have a better idea if you look at the photos via the link to see a bigger view of Fed Square, but it has been criticised for being unfriendly to people with mobility problems. This is quite so, although everywhere is accessible by lifts. This blue symbol indicated the easiest path to take up the slope of Fed Square. Complainers should visit Europe and they would really know about cobblestones. These tell an interesting story, and some of them refer to the culture of the local Aboriginal tribe. They are rather difficult to read and take some time to do so. Lacy knickers for the trees? The white things are not the trees' flowers. Atop steps looking across Flinders Street. Tryptic panels, she called them. Shapes within shapes. SBS offices and studio. It is our second government broadcaster and has a multi cultural focus. Unfortunately it has been forced to become commercial and while not as bad as commercial media, the ads are annoying. The square can hold 10,000 people, and has done, especially when there is major sporting event on the large screen. Dear Copperwitch's favourite and very expensive glass shop is somewhere on the left in the atrium. On Sundays an expensive second hand book market fills the space. This is something I had no idea about. Fed Square is built over railway lines and between the railway lines and the floor is what is called The Labyrinth, tunnels riddling the whole structure. At night in the summer, cool air is drawn into The Labyrinth and the air cools the surrounding concrete and also the cool air is blown out into the building for cool air the next day. The area requires no air conditioning in the summer and excess cool air can be diverted to other areas of Fed Square. The principle is reversed in winter, but some supplementary heating is needed. There are a few of these timber slatted areas and they are where the air is blown in. As you can see, some thought it was a nice warm spot to sit, and it was. The tour finished at the river side of Fed Square, an area where few people linger. But lingering is worth it. Have a look up high at the reflections. It was a terrific tour, about 45 minutes I think. Our guide's knowledge was immense and not just about Federation Square. I chatted to the guide a little after the conclusion of the tour and I mentioned other tours we had taken, such as the Block Arcade and Melbourne Town Hall. Of course she recommended the tour of the branch of the National Gallery of Victoria within Fed Square. But, she said, the tour of the State Library is excellent. Don't miss it, so we won't, one day soon. You thought I had finished? Not quite. Ingratiatingly I asked our guide if she knew our neighbour HH, who is similarly aged and also works as a volunteer at the Visitor Information Centre. She smiled warmly and said, yes, of course yes, I know HH........yet there was something in her smile that told me they were not best mates. Don't ask R about HH. I don't mind her though. Down the status ladder of volunteers, some stand on city street corners helping tourists and are identifiable by their red jackets, hence we call them Red Coats. Being a volunteer behind a counter or giving tours are sought after positions, with no pay of course.